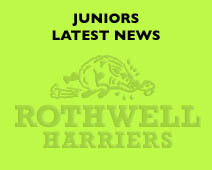 Juniors Latest News – Rothwell Harriers & A.C.
All the latest news and views. Be sure to check here regularly for information about forthcoming events, reviews of recent events, training news and other important information. Please also check the Rothwell Harriers Juniors Facebook page for last minute news and information. The cross country season is nearing a close and we had some great performances at the recent Yorkshire and Northern Championships. Just the last few schools events and the National and then we are into the Road and track season.a Well done to all the athletes who have represented us on the road and in the mud, including those who obtained representative vests. The Yorkshire Road Relays are the 30th of March and I hope to put bigger teams in this year. We Have a new Mascot a wild boar to represent the Club at all Events He has been chosen to be called ‘KEVIN’ name chosen by all under 11 athletes, He will be given out to athletes 11 and under for efforts at Cross country and taken to each race. NEW for Rothwell Harriers Juniors in 2017 and now in the 2nd year of participation is an independent series of races and junior parkruns in our local area that can be entered by all our junior athletes here: http://www.leedsathletics.net/Leeds_Race_Series.htm There will be trophies for winners in all school year groups. Parents should enter their junior athlete asap and all races in the series that have already been held will be added to their score i.e. backdated soon.